Which is the diatonic harmonica? It’s the short 4 or 10 hole harmonica. Sometimes referred to as the ‘blues harp’, it comes in a variety of brands including Hohner, Lee Oskar, Hering, Huang, Seydel Söhne, Bushman and Suzuki. 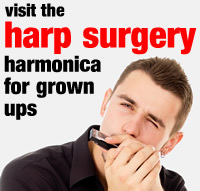 Do you teach Chromatic harmonica? Apart from the third position blues theory for the diatonic and chromatic note layouts, no we don’t teach practical Chromatic (slide or push button) harmonica. But we can refer you to specialists who do. Nope! As long as you have your ears, you’ll do fine. A diatonic harmonica in the key of C if you have one (or we can supply a harmonica), a note book and pen, any tutorial manuals you may have been using, your ears and a sense of adventure. Oh and the lesson fee is always useful.